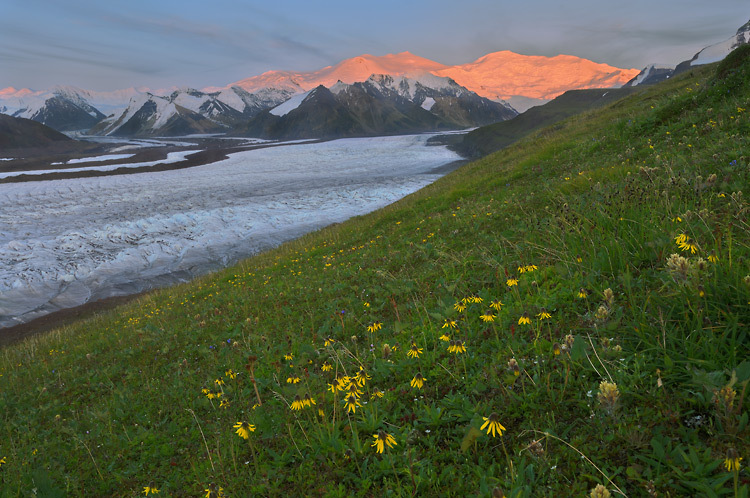 Russell Glacier and Mount Bona and Mount Churchill, alpenglow at sunset, and an array of wildflowers in Wrangell - St. Elias National Park and Preserve, Alaska. Please click on the image above to view a larger version of this photo. Here’s an oldie but a goodie; well, not really an ‘oldie’ in the sense of a photo I took a long time ago, but a recent version of a favorite scene of mine; Mt. Bona, Mt. 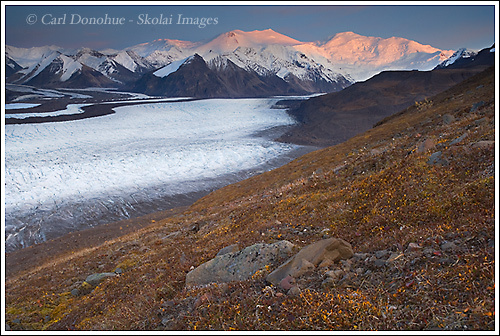 Churchill, the University Peaks and the Russell Glacier, Wrangell – St. Elias National Park and Preserve. I shot a very similar composition to this a few years ago on a Skolai Pass Photo Tour in the fall. We very nearly didn’t get this scene last week. After a long backpack (made even longer by twice running a grizzly sow with her 3 cubs) we made camp and had a well – deserved supper. Tired, I watched as the light started to get better in the late evening, and thought it might be worth a hike a little further over toward this scene. In part because I wanted to shoot the alpenglow, but also because I wasn’t sure if the weather would hold until the next day, and I so wanted the 2 people on the trip to get to see this view while it was clear; I convinced one of the folks to join me for a walk, and we headed off toward the glacier. When we arrived, the sun was still well up, and the light not nearly so warm. We made some photos, scouted out possible compositions, and waited around for the evening light; instead, the light faded; distant clouds behind us blocked the fading sun from the mountains, and the light dimmed. I thought it might be worth heading back toward camp in the hope of maybe catching some colorful clouds at sunset. We walked about 10 minutes in that direction and starting shooting some images in that area. I turned and saw the light in this direction start to glow again, and knew it would be a good idea to head back. I had to hustle back got back just in time to catch the last of the alpenglow. Having already been here earlier, I knew exactly the foreground I wanted, which lens and composition I wanted, and this shot was merely a matter of pointing and shooting. I guess in some ways this scene isn’t anything new, as I’ve shot almost from this very spot before; but it’s not a bad place to spend a nice afternoon, and even make some photos all the same. This entry was posted in Adventures, Alaska, Backpacking and Hiking, Landscapes, Photo Tours, Wrangell - St. Elias National Park and tagged Chitistone Pass, Landscapes, Mount Bona, Mount Churchill, Russell Glacier, scenics, Wrangell - St. Elias National Park on July 31, 2011 by Carl D.
I just got back from a totally awesome trip to Skolai Pass – some great weather, wonderful folks for company, and we all had a killer time in the coolest place in the world – Skolai Pass! 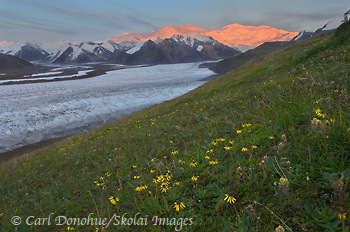 This image was taken the first evening, after we backpacked up to Chitistone Pass, walked south to the Russell Glacier, and watched the alpenglow rock Mt Bona (on the right) and Mt Churchill (center). The rest of the trip I hiked around the area and had a blast. I didn’t hardly shoot anything, of course, because my *#^$$*#^# camera ceased working the following morning. One of the people on the trip was kind enough to let me use his backup camera, which was WAY cool. Thanks Doug! Always have a backup camera body with you. This entry was posted in Adventures, Alaska, Backpacking and Hiking, Fall, Landscapes, Travel, Wrangell - St. Elias National Park and tagged Fall, Landscapes, Mount Bona, Mount Churchill, Russell Glacier, scenics, tundra, Wrangell - St. Elias National Park, Wrangell St. Elias on September 13, 2009 by Carl D.